“The ultimate measure of a man is not where he stands in moments of comfort and convenience, but where he stands at times of challenge and controversy.” These famous words flowed from the lips of a man many—most, for that matter—would consider a Man of the Year in his time, Dr. Martin Luther King Jr. He was onto something. After all, no one who has changed the world did so by staying comfortable or playing it safe. In this vein, each of the men featured in the following pages has carved his own path, often at the risk of great peril, in pursuit of the proverbial brass ring. In speaking with each of them, none was willing to proclaim himself “different” or “special” or worthy of being included in a story titled “Men of the Year” … which is why we’re doing it for them. 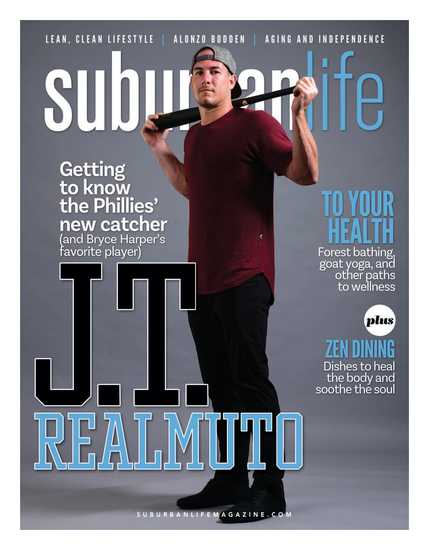 From record-breaking adventurers to revolutionary businessmen to compassionate philanthropists doing their best to save the world (or at least a small part of it), the Philadelphia suburbs have no shortage of inspiring yet humble men who look at life as a looming and ever-changing mountain just begging to be conquered. Suburban Life presents … the 2011 Men of the Year. If Todd Carmichael has a secret weapon, it is his freakish endurance. This gift has enabled him to build one of the nation’s premier coffee roasters out of nothing and, more famously, accrue world records and national headlines for expeditions that would kill or maim 99.9 percent of the human species. The once-tiny Philadelphia-based coffee roaster of which he is co-founder and CEO, La Colombe Torrefaction, has since grown into a nationally recognized, socially responsible business that’s on pace to grow 50 percent this year. Although impressive in itself, it’s his activities away from “the office” that have earned Carmichael his notoriety. In 2008 he spent more than a month trudging nearly 700 miles across Antarctica for 15 hours a day, alone in subzero cold and battling some of the strongest winds in the world, hauling behind him more than 250 pounds of food and provisions. He reached his destination—the South Pole—in 39 days, 7 hours and 49 minutes, breaking a world speed record in the process. Again, he relied on his seemingly superhuman ability to endure, pushing any nagging thoughts that could unravel his expedition far from his mind. His interest in so-called endurance trekking grew out of his early years rooted in Spokane, Wash. A long-distance runner in high school and college, he would run 100 miles a week and supplement his appetite with climbing trips to the nearby Cascade Mountains. A natural question began to bubble up within: “How far can you go … and where can you go?” For Carmichael, it turns out, farther than just about anyone. Although some people might shake their heads at the sheer magnitude—the ridiculousness, the inherent peril—of his expeditions, his obsession is no different than, say, committing to a marathon or training for any other goal of personal importance. The key to making it happen is to be, in a way, selfish. “There are a lot of people before and after who really don’t want you to do it, whatever it is,” he says. “You’re not going to make it to the Pole if it’s for someone else. When you’re out there, no one else matters. The only thing that exists is that 100-naut wind and the fact that it’s 70 below. The reason you’re doing it better be inside your chest. For his next feat of derring-do, he will traverse another expanse famous for its harshness: the appropriately named Death Valley on the California-Nevada border, where daytime temperatures in its hottest months—just when Carmichael plans to make his trek—spike in the neighborhood of 130 degrees. (“It’s 125 in the shade,” he says.) He had planned to make the trip this September, but an unexpected delay in the adoption of a son from Ethiopia put his plans on hold. His new target to conquer Death Valley: September 2012. He’s attempted to cross the infamous desert before, but sometimes “it takes a couple chops at a piece of wood to split it,” he says. It is familiar territory to a degree, as Death Valley bears some likeness to Antarctica in terms of its vastness, lifelessness, severe temperatures and, as a result, lethality. He intends to make the 170-mile trek in less than 12 days, pulling hundreds of pounds of life-giving water and food in a self-made rickshaw. Carmichael’s expeditions, he believes, actually make him a better parent. He and Hart have four children—“Five would be one tattoo too many,” he says—all of whom are adopted, including the son who was still in Ethiopia as of press time. Silverman may be a bit of a misnomer, because nearly everything this 91-year-old businessman has been involved with has turned to gold. Herman Silverman is the founder or progenitor of many things: Sylvan Pools, once the country’s largest pool builder; the Silverman Family Partnership; the Art Mobile; the Doylestown Hospital Heart Club (now the Heart Institute); and, famously, The James A. Michener Art Museum. He’s also past president of his alma mater, Delaware Valley College, and board member of the Pennsylvania Housing Finance Agency. Perhaps this creativity was sparked by childhood visits he and his friends enjoyed to the nearby Philadelphia Art Museum. “I got to see all of this wonderful art,” he says, “and realize there was so much more to it.” In the early 1980s Silverman was working with officials to promote the arts in Bucks County through the creation of an Arts Council, the appointment of a poet laureate and the institution of a traveling Art Mobile that taught children about painting, sculpture and other mediums. But his ultimate goal was to create an art museum to showcase the style popularized in Bucks County during the first half of the century. An opportunity to accomplish this presented itself in the form of a new jail; the relocation had left the county in charge of the former jail building, which stood in the heart of Doylestown. With the same drive and creative thinking that he employed to build his business, Silverman set out to turn the old jail into a museum. Among the first decisions made was the one to use the name of his well-known friend and Bucks County native, author James Michener. He and Michener had grown up in similar circumstances and agreed on the importance of public art. This selection enabled the organization to raise more funds than it could have otherwise. A prominent name alone was not enough, however, so Silverman and his fellow board members sold signed limited-edition prints and Key Club memberships to raise the funds needed for their goal. The James A. Michener Art Museum opened its doors to the public in 1988. Silverman has built quite a legacy to share with his four children, seven grandchildren and two great grandchildren. “I have been able to do all these things because of the encouragement and support of my first wife Ann (to whom he was married for 65 years before her death), my current wife Elizabeth Serkin and my family.” As for how he continues to accomplish so much: The secret, he says, is that he enjoys his life. For starters, each day he drives to the office in his BMW convertible. Attorney Kevin Zlock has earned a sterling reputation in a line of work not always known for its warmth and fuzziness—namely, divorce law—yet a deep-running philanthropic streak proves that he has anything but a hardened heart. Earlier this year, Zlock and his wife, Sima, donated $100,000 to establish a fund—the Kevin Zlock Veterans Family Endowment at Bucks County Community College in Newtown—to provide tuition assistance and other benefits for educating and otherwise improving the lives of veterans who have served the country abroad. The endowment is by no means the only charitable cause the Zlocks support. They recently gave sizeable donations to the Travis Manion Foundation in support of the 9/11 Heroes Run, for example, and A Women’s Place in Doylestown, among others. In addition to his philanthropic work, Zlock fills his days and nights fighting for clients’ rights through his firm, which has offices in Langhorne and Doylestown. History suggests that perseverance and a fighting spirit flow through Zlock’s veins. When he was fresh out of law school, for example, he applied to the FBI, and he would have gone into the program at Quantico, Va., if a hiring freeze hadn’t urged him to practice law instead. Based on his curiously diverse résumé, one might suspect John McColgan is saddled with a nagging case of attention deficit disorder. With “job titles” such as inventor, painter, musician/composer, producer, venture capitalist, philanthropist, etc., and the countless stories culled from his experiences at home and abroad, it seems he could give Dos Equis’ “Most Interesting Man in the World” character a run for his money. “I’ve been fortunate to connect with so many good people—that’s the main thing for me—but they have to have desire, inspiration and passion in whatever they are doing,” says McColgan, born in Geneva, Switzerland, and now living near Princeton, N.J., after years spent in Bucks County. “Money goes away. Looks go away. But good relationships and connecting with people can create experiences that are never forgotten and can be passed on. Regardless, all the projects he undertakes share a common denominator: Each one must somehow increase the quality of someone else’s life. Such thinking guided him in the invention of a next-generation air purification using nanotechnology catalysts, specifically heterogeneous catalyzed photolysis hydration, which he has since sold to another company. McColgan spent part of his life traveling in the remotest reaches of the Caribbean, South America and Australia, among other places, where he met shamans and “medicine men” who introduced him to plants with healing properties that could, say, relieve pain or help stroke victims regain their vitality. (He’s also the inventor of the Jugular PainFighter, which is designed to soothe aching joints and muscles, as well as overseeing all of the formulations for the Jugular and Go For The Jugular brand of products: drinks, shots and gels directed to the Mixed Martial Arts and sports arena.) He is currently working on a new product in conjunction with Laurel Roberts, daughter of “Horse Whisperer” Monty Roberts. For his part, McColgan has found healing and catharsis through painting. He began creating his own art at the age of 3, while living in Barcelona, Spain, and his skill and style have evolved with time; in recent years he has completed more than 100 works in the so-called mandala style, for example. He refers to his current style as “abstract expressionism.” Ever the nonconformist, he makes his own paints using high-density pigments with his own polymeric formulation, and also employs distinctive “tools”—twine wrapped around twigs with nails, for example—to create vibrant, strikingly original pieces, some of which measure 6 feet by 10 feet. He has never wanted to exhibit his art publicly until recently, so his work is likely to become much more visible in the near future. His name is Jeffrey Dobkin, and even though his background is more closely linked to marketing rather than medicine, you almost want to call him “Doctor.” He’s uncovered a surprisingly uncomplicated and somewhat controversial procedure—the Dobkin Technique, he calls it—he believes can stave off brain damage after the body has technically died. He understands that such dubiousness is understandable, to a degree. He started researching the topic in 1977, after reading an article in Newsweek about a boy who fell into ice-cold water and, even after being plucked from the depths 45 minutes later, suffered no significant brain injury. Dobkin then became “obsessed” with the idea and, at a time before e-mail and Skype, gathered background materials and medical papers from around the world by way of Teletype. His conclusion: Damage to the human brain as a result of lack of oxygen—also known as anoxia—can be delayed by up to an hour by triggering a response known as the mammalian diving reflex. He advocates a simple technique to trigger this “delay of brain damage” in victims of cardiac arrest and other forms of anoxia by immediately applying cold, wet compresses to the face—particularly the eyes—of the victim until emergency medical personnel arrive on the scene. Of course, he also advocates learning proven lifesaving techniques such as CPR. Dobkin has made his Merion Station-based organization, The Brain Injury Foundation (BrainInjuryFoundation.org), into a 501(c)(3) nonprofit, thereby enabling him to garner support monies to fund his research. In addition, he’s in the process of applying for grants he believes will enable him to partner with respected medical professionals to further bear out his theory. The modern-day adventurer no longer carries a spyglass and map; these days, explorers have day jobs. In this vein, Dr. Edward Woehling wields a dental pick in his practice, Bryn Mawr Periodontal Associates, but still finds time to travel the world. Dr. Woehling’s family has embarked on adventures both with and without him, including living in the Costa Rican rain forest, where they assisted native families with chores and everyday work to “pay it forward.” Philanthropy is an important aspect of the family’s lifestyle. Each year his practice is part of the Annual Main Line Dental Golf Invitational, now in its 13th year, at the Moselem Springs Golf Club. This year the two-day spring outing will donate proceeds to an as-yet-undetermined charitable cause. If you ask Jeff Brandt, making a difference in other people’s lives is just good business. Like many students, Brandt realized after his first year of college that his chosen major no longer interested him. But, unlike most, he spent that year’s summer break volunteering at a facility that fit patients with prosthetics and orthotics. After becoming highly trained, getting every certification he could and doing a residency in each specialty, Brandt practiced for several years before starting his own company in 2004: Ability Prosthetics and Orthotics, which is based in Exton. The company specializes in evaluating, designing and fitting patients with artificial limbs, braces and other prostheses engineered to help them live better, fuller lives. Ability has since spawned two complementary businesses: Symmetry Post Mastectomy Solutions, which provides mastectomy prosthetics; and Kinetic Revolution, a product development company. “Patient-care practitioners were coming to us with ideas,” Brandt says. “This [company] gives them a pipeline to bring products to the market and bear out test results.” The company already has three products on the market, which it has been able to provide in Ability’s many offices. Together the companies have 40 employees, which Brandt describes as being “as close to family as 40 people can be,” and says the good relationship shows in the high quality of patient care they collectively provide. Quality care is not limited to the business. “You are a product of your experiences,” he says, referring to the companies’ charitable efforts. It struck him as odd that his previous employers would accept insurance money from patients who suffered from a disability but not donate to the charities created to help those patients. “You cannot operate in a community and expect to succeed if you won’t get involved,” he says. “It is easy to write a check; it is not as easy to spend a Saturday [volunteering]. Brandt’s 11 offices, spread across five states, are involved with programs in each of the communities in which they do business. Among them: sponsoring charitable 5K runs, health fairs and the Adaptive Sports Program of the West Chester YMCA, which organizes a monthly activity for disabled participants who want to learn a new sport. Ability is also active with Physicians for Peace, which accepts used artificial limbs Brandt pays to have shipped to his office and organizes Scout troops to disassemble. The components are then distributed globally to where they are needed. “When you are doing a good job,” Brandt believes, “it comes back to you.” But, he says, “you have to put yourself out there to be vulnerable.” Recently, Ability learned of a 16-year-old amputee who was raising funds to purchase his own prosthetic arm. It was not known if the patient’s insurance would assist, so Ability offered to provide the prosthetic at cost. When the insurance company came back and agreed to pay, he chose to put the money into a fund to help someone else. The story was then submitted to the reality show, “Extreme Home Makeover,” and the show’s producers decided to feature the young man—including Ability’s involvement—in an episode that is expected to air sometime in November. In September 2005, Dave Scopinich stood atop California’s signature peak—Half Dome (elevation: 8,836 feet) in Yosemite National Park—halfway through what a fellow climber described to him as North America’s most grueling day hike. There on the bald granite, thousands of feet above the valley floor, Scopinich “cried like a baby,” not bothering to shield his eyes from the friends with whom he’d scaled the mammoth peak. Such naked emotion is understandable, considering his accomplishment. Although the hike posed a formidable physical challenge in a landscape serene enough to steal one’s breath, his tears were more the result of an achievement whose beginnings could be traced to a day several months—and tens of excess pounds—earlier, when he was a completely different person. For as long as he could remember, Scopinich was the “fat kid.” There was a time, in fact, when he tipped the scales at well above the 300-pound mark. When he reached Half Dome’s peak in 2005, however, he had worked himself down to a trim 198 pounds. His weight-loss success story took a brief detour in the months and years after he got off the mountain. Although other parts of his life were flowering—a happy marriage; the joys of fatherhood (one girl, two boys); and a career that had him growing steadily into management positions for powerhouses in Philadelphia radio—he steadily regained much of the weight he’d lost. Scopinich, 36, studied journalism at Penn State University, and worked as a reporter before realizing he wasn’t going to be “the next Mitch Albom” as a sportswriter or novelist. He also had a significant obstacle to overcome—lingering debt from sports bets he’d been making since the age of 15—and thought a sales job would be the best way to climb out of the red. Although he declined to specify the amount he owed—“a big number,” he says—it was enough for some friends to advise him to declare bankruptcy, though he never did.